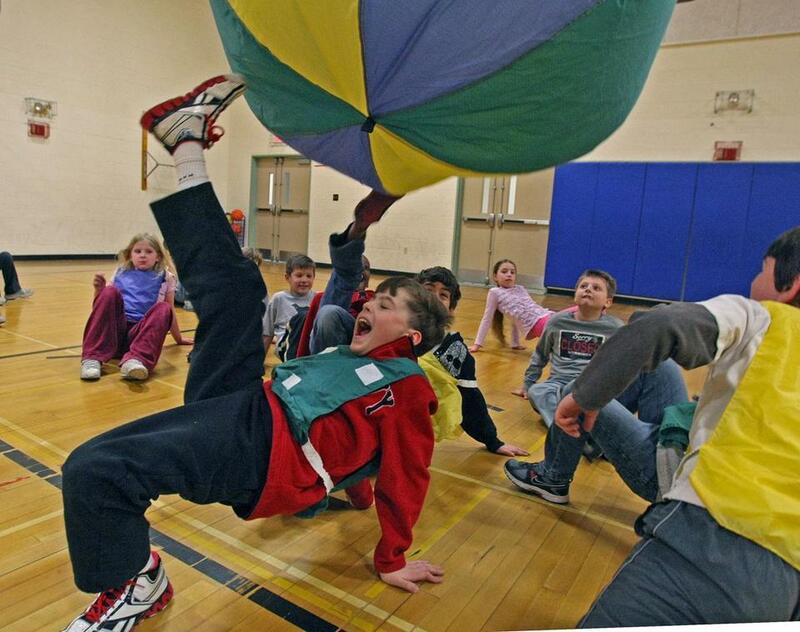 Pupils at Sharon’s Heights Elementary School play “crab soccer’’ during activities to build strength, balance, dexterity, and problem-solving skills. SHARON - If the awe of space flight inspires Tim Vigorito’s students as much as it did him, he’s got a good thing going. Vigorito’s effervescent passion for space came to the attention of NASA through an industry newsletter, leading the space agency to select the town of Sharon, where he teaches physical education at Heights Elementary School, as one of three US communities to participate in the first year of an international program called “Mission X: Train Like an Astronaut.’’ A smaller, pilot program took place last year. Teachers at each of the Sharon elementary schools led students in grades 3 to 5 through a six-week series of physical activities and nutrition lessons, all with a space-flight theme. Students in 15 countries participated, and their teachers posted updates and photographs online. Not only did the students learn about fitness and space, but it became a cultural exchange of sorts, too. In Torino, Italy, a class made breadsticks, a local specialty, during one of its healthy food lessons. And when Vigorito spoke to some of his colleagues in Europe about the “spacewalk’’ activity, which involves a “crab walk’’ position on all fours, belly facing the sky, a European colleague suggested having the kids play indoor soccer in that position with a giant, lightweight “moon’’ ball. Facts about the “Mission X: Train Like an Astronaut’’ program. On Friday, Sharon fifth-graders will take part in a closing event for the US teams. They will interact via live video link with astronaut Dorothy Metcalf-Lindenburger and other NASA staff at the Johnson Space Center in Houston. Metcalf-Lindenburger taught earth science at a high school in Vancouver, Wash., before being selected to join the space program in 2004. She went into space aboard the shuttle Discovery on a mission to the International Space Station in 2010. During the closing event, a few students from each of the US communities - Dunkirk and Jamestown, both in New York, along with Sharon - will have the opportunity to ask questions of the NASA representatives. Provided no technical glitches get in the way, the 11 a.m. event is scheduled to be webcast live at www.nasa.gov/offices/education/programs/national/dln/index.html. Vigorito said he and the students have developed a special relationship with schools in the United Kingdom and Italy, and those schools plan to watch the webcast. The celebration will mark the end of weeks of space-themed activities. On March 16 in the Heights Elementary gymnasium, third-graders tried their hand at challenges designed to build strength, balance, dexterity, and problem-solving skills. 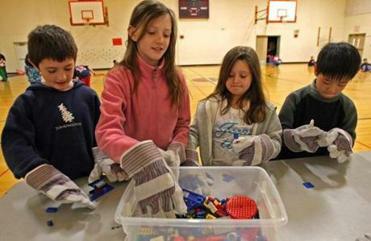 At the “Crew Assembly’’ station, groups of four or five students donned heavy, adult-sized work gloves and tried to work together to assemble an object from Lego bricks. The challenge was to use at least 25 bricks, make the object at least three bricks high, and finish within three minutes. One team got close, but came up short on the 25 bricks. “It’s very social. You’re not just sitting in your seat,’’ said Bradley Corn, 9. In another activity, “Mission: Control!’’ the students honed their balance and spatial awareness by standing on one foot, with the other raised behind them at knee level, each throwing a tennis ball against the gym wall and catching it without letting it hit the ground. They learned how astronauts sometimes experience changes in balance and spatial awareness when they make the transition into space and back to Earth. An activity centered around gravity saw them lifting balls of varying weights, and another, called “Let’s Climb a Martian Mountain,’’ had them climb wall-mounted bars in the gym. Vigorito likes how the activities bring out physical skills in students not always drawn to sports. But the children still get a workout, he said. He wants to keep them moving as much as possible. “I want them dying for water when they leave, and their faces beet-red,’’ he said. The NASA program includes science lessons about nutrition and fitness, such as how to read nutrition labels, how to build strong bones, and how excess fat in food affects the human body. One lesson involves liquefying a fast-food cheeseburger and fries in a blender, freezing the liquid, and observing the layer of fat that forms. For each activity, teachers assign points based on students’ efforts and accomplishment, though Vigorito said the points are subjective. Teachers report the points to NASA, which converts them into “steps’’ for Astro Charlie, a cartoon character on the program website, www.trainlikeanastronaut.org, who walks across the screen from the Earth to the moon over the course of the program. For each “step’’ the children took with their activities, Astro Charlie took a step toward the moon. Sharon’s selection for Mission X would not have happened without an optional class Vigorito started about five years ago. One winter, parents asked him to let children play basketball one day a week when it was too cold to go out for recess. Instead, Vigorito, a self-described “space nut,’’ decided to lead an interactive class that became known as Space Camp. After the class had been running for some time, he e-mailed Lockheed Martin, the company building Orion, a new spacecraft scheduled for an uncrewed test flight in 2014. Lockheed started sending pictures, posters, and paper models of Orion. Then, Sharon was featured in the company’s Orion newsletter, Vigorito said, and NASA took notice. Chuck Lloyd, a program manager at NASA, said the space agency selected Sharon first among the US communities for Mission X 2012, thanks to Vigorito’s commitment and enthusiasm. “To me, he’s a poster child for what we’re looking for,’’ said Lloyd. This year, about 750 Sharon elementary students participated. A few older students even got into the act when the middle school marimba ensemble played a song called “UFO,’’ which teachers recorded on video and posted online. Next year, Vigorito hopes to expand the program to include Grade 2, and perhaps the middle school. Lloyd said NASA has decided not to turn away schools that want to continue for 2013, though if the number of schools gets too large in future years, the agency may have to limit it. Heights Elementary plans to continue indefinitely, with Vigorito at the helm. He said he never knew that his first encounter with space - when his mom called him into the front yard to watch the fast-moving light that was the launch of Sputnik in 1957 - would lead to this.